JONAS VINDUER wooden sliding doors are produced from a laminated finger joint pine. Wood girders glued from three layers, which are very durable and resistant to deformation. This kind of girder does not have any possibilities to bend, rotate or crack. Three layers glued wood girder, which is used for wood windows and doors manufacturing, protects the surface from cracking. Wooden sliding doors can be made in very large dimensions. You can choose from variety desired colours, glass type, locking, vertical or horizontal bars. Wooden sliding doors are completely safe in case of strong wind. High quality weather strips ensure insulation against negative water and cold impact. You can choose handle on both sides + keys if needed. Wooden sliding doors with aluminum coating is even better solution under difficult weather conditions. 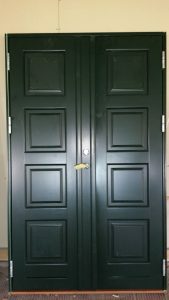 These doors compared with standard wooden sliding doors, will last longer and there will be no need to think about repainting it after several years. Mostly, people, who want to create a cosy atmosphere and have an exclusive style, they prefer wooden doors. 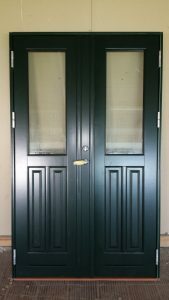 High quality of wooden doors will make Your house warmer and beautiful. 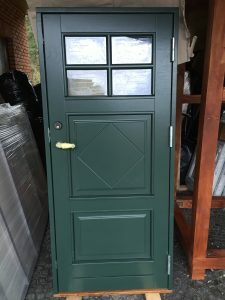 We also have an option to produce old-style wooden doors for old town, cabins or old style houses. Usually, JONAS VINDUER uses the ASSA locking and handles for the main entrance wooden doors. 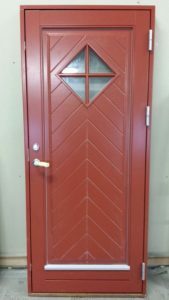 If You have a picture of Your old door – we can try to make it as much similar as it is possible. Actually, “fish” style doors are very popular in cabins nowadays. Please, check our huge wooden doors gallery, and You will find the most beautiful type for Your home. 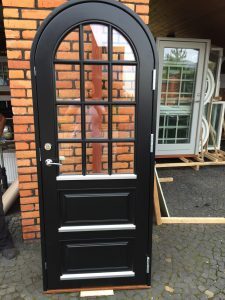 Why to choose wooden doors? Wood is “breathing”, it helps to control a humidity balance indoors. Furthermore, we can offer a folding system, made of PVC, wood, wood or aluminum (SCHUCO/REYNAERS). Folding sliding doors ensure a completely clear entire opening, without fixed sections. You can customize Your folding door by choosing desired panel number and opening combination, colour, glass unit and various dividing. Besides, it is very popular to produce folding systems made of the highest quality SCHUCO or REYNAERS aluminium system. Very large dimensions are possible.